The picture below shows a Rear Hagon Road Shocks. Thousands of other top quality spares listed on our website at refreshingly low prices. *Feature a black body with choice of chrome or black, standard or slimline springs. *Supplied in complete pairs with spring adjuster spanner. *Spring and damper rates are tailored to each bike model. *Automatic compression & rebound damping control with hard chrome piston rod. *Quadrate progressive action springs (except 30kg/cm and above) adjustable by conventional stepped cam ring. 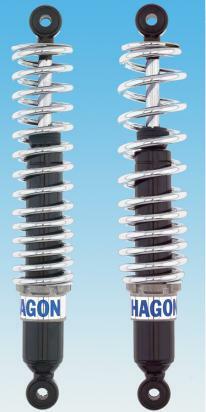 All Hagon shocks have a 2 year unlimited kilometer guarantee and are TV approved.